What I hate about them is storing them. Ugh! If you put them in a drawer you can’t find which one you want and they get hugely wrinkled. 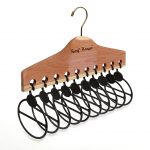 There are cool scarf hangers but they can be expensive. It’s a luxury right now since I need tons and with wanting to put home remodels. There had to be a cheaper way. And when there is a will, there is a way…so I made one. Start with the hanger lying on the ground flat. 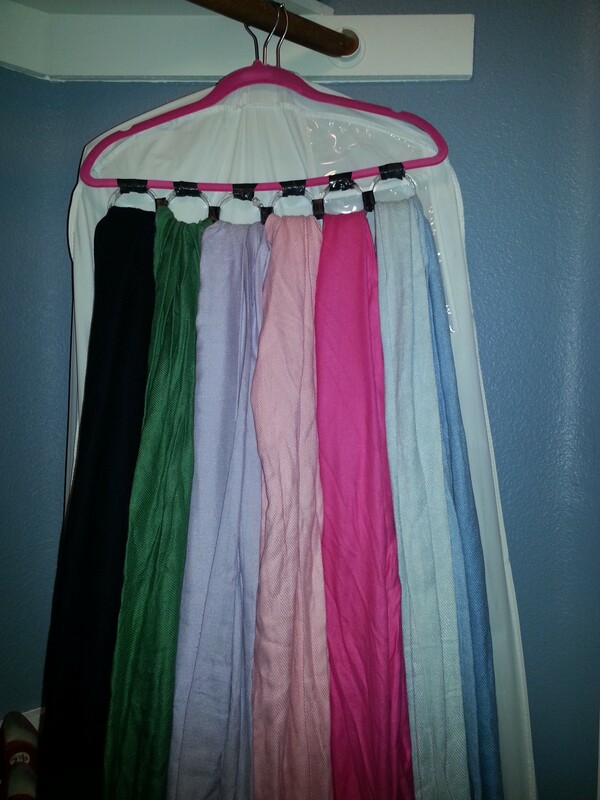 Take your curtain hangers and lay them flat in a single row. This should be approximately 1/2 inch to 1 inch smaller than the bass of the hanger. Do this to judge how many you will need for the first row and what is centered. Next take your tape and secure each loop to each loop and then the hanger. Do this by wrapping the tape around the connecting sides of two of the curtain hangers. Wrap it several times to make sure there is a good hold. 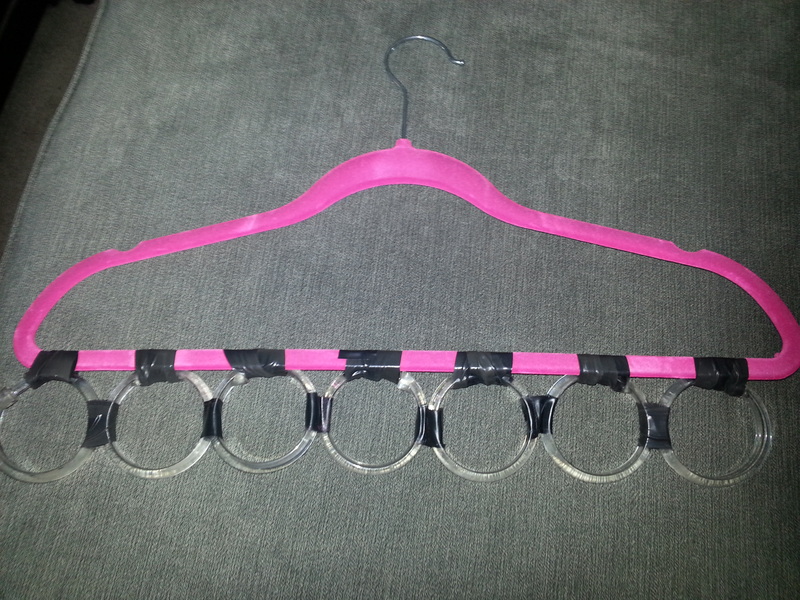 Secure the shower curtain hangers to the hanger itself. Again wrap the tape around the base of the hanger and top of the curtain hanger, securing it to the hanger. Wrap multiple times. If you desire a second row, repeat step two with one less shower curtain hanger. 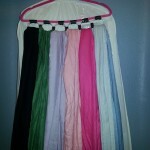 Tip: Fit the second row of hangers in the indentation created by the two adjoining curtain hangers on the top row. To secure row one to row two wrap your tape around the hangers by forming a triangle with your tape. Wrap hanger one to two, then two to three and lastly, three to one. This creates a tight bond. Hang your scares and enjoy! Tip: Don’t do more than two rows as it defeats the purpose of hanging them to see them better. I like my DIY solution. In the future I may go more fashion forward with the tapes but it works for now, meets the need and well cost me nothing as I had all the supplies laying around! What about you? Have you had a challenge that you found an inexpensive DIY fix for? Let me know. What a clever idea! 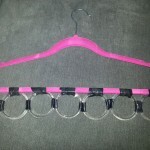 I can see using the new fun colored duct tape and making a wild blingy hanger, lol. Thank you for the great DIY tip!